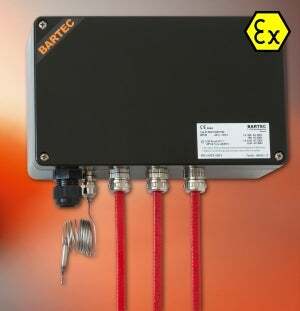 The new BSTW II family from BARTEC replaces the existing products in the current series. In this new generation the focus was placed on increased safety and cost optimisation. The new BSTW II has system approval for hazardous (potentially explosive) areas (94/9/EC) which covers the self-limiting heating cables also. This means for example that BARTEC’s established heating tapes, such as PSBL, PSB, MSB and HSB can be connected directly and operated in the new mechanical controllers and limiters. Installation does not require any additional junction box or individual acceptance test on site. This results in considerable savings in costs in designing, materials, installation and operation. In addition, the use of less and optimised components increases safety and reliability. In the new BSTW II family the current carrying capacity has been increased from 16A to 25A. Longer heating circuits can be connected to a controller and limiter, which also cuts costs in installation and in material consumption. The ambient temperature range is -55°C to +50°C. Installation is now possible on all continents with standard products. Large 6-mm² terminals allow easy installation, even in harsh environments. The BSTW II family is available as a single-channel controller and limiter, as a combination unit with a controller and limiter for constant wattage heating cables and also as a multi-unit. Up to three heating circuits can be connected in the enclosures.